The University will allocate a proportion of available scholarships 2017 to the highest scoring valid applicants following these dates. 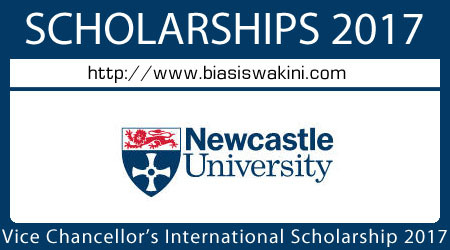 Newcastle University offers partial scholarship awards to encourage applicants assessed as international for fees purposes to undertake Undergraduate and Master’s level study. Each award is worth £3,000 for one year payable to the student’s tuition fee account. - Registered at Newcastle University for the 2017/18 academic year. - students new to the University and not those transferring or repeating courses. - UK or EU students assessed as ‘home’ for fee purposes. - MPhil, doctoral (eg,PhD, Integrated PhD, EngD, DClinPych), Postgraduate Certificate, Postgraduate Diploma, Newcastle University intercalating students or placement, study abroad or exchange students. MSc Hydroinfomatics and Water Management (Euro Aquae) students are not eligible for this award. - holders of fully-funded scholarships (full payment of fees and living expenses) such as Chevening Scholarships, Commonwealth Scholarships or other fully sponsored awards. - applicants initially assessed as international for fee purposes but whose fees change to ‘home’. 0 Komentar untuk "Vice Chancellors International Scholarships 2017"